Emerging and independent artists, take note! If you’re planning to exhibit at [SOLO] alongside Artexpo New York or as a Rising Artist at one of RMG’s other amazing art shows, here are some tips to help you prepare for your exhibition, brought to you by seasoned artist and past [SOLO] exhibitor Karen Kohtz. So, you’ve made the decision to be a Rising Artist or [SOLO] exhibitor. Congratulations! Your action has already set you apart from the majority of other artists. Taking this step proves that you believe in your creative voice and are confident in your talent. Exhibiting offers you a tremendous opportunity to show who you are as an artist and take your career to another level. Being clear about your vision is the most important thing. Next, you have to ask yourself: How are you going to show that vision to the world? 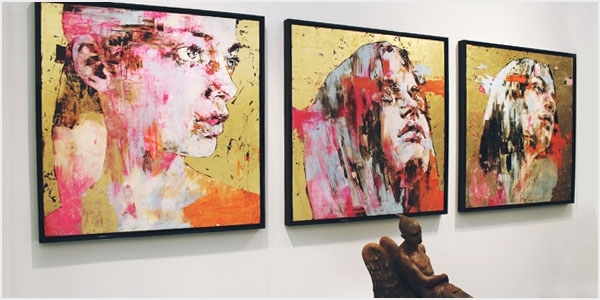 Here are three helpful tips to consider when preparing your booth at an art show. As a well-seasoned artist, you likely have expertise in an array of styles. Developing all of these various skills has brought you to this point in your artistic career, but one of them should stand out above all others. This is the style you should focus on. Let’s use Picasso as an example. In work from his early career, you often find pen-and-ink drawings of nudes and landscapes—but this is not what comes to mind when we think of Picasso as an artist. We recognize him for his Cubist style; that’s where he made his mark. As you prepare your booth, you want your collection of work to portray one theme or artistic style that best represents you. Bring only your best original work. When making your selection, ask yourself: Do my pieces complement, rather then compete, with each other? If your art studio looks anything like mine (complete creative madness), then the discerning eye of another may be helpful. Find a fellow artist or person you respect in the industry to bounce ideas off of. In the end, you will make the final decisions, but the perspective of an objective outsider may help you in making the right ones. TIPS & TRICKS FOR HANGING YOUR ART), but let’s go over the basics. Don’t make the mistake of hanging too much in your booth. You should allow adequate space between each piece so they can be viewed properly. Feel free to bring extras for back up (there is generally some storage space provided close by for your additional work), just don’t hang it all at the same time. Let’s take Neiman Marcus vs. a lower-end department store as an example. At Neiman Marcus, high-end designers have an area in the store for display. The clothes are spaced generously between each other on the racks for viewing, and a stunningly dressed mannequin is there to catch the eye of shoppers. The presentation is extremely appealing. In lower-end department stores, however, the experience is very different. You often see tons of clothes packed together on rack after rack. The racks themselves are placed so close together that it is sometimes hard to maneuver around them. In their attempt to show you everything, you can’t find anything! Which of these two stores do you think is justified in commanding the higher price? The same theory applies to displaying your art. When you set up your display in a way that honors your artwork, you’ll be able to fetch a higher price for it. With your show coming up soon, I’m sure you are in the heart of your creative process. You have stepped up with passion by registering to exhibit at this event. I admire anyone who has the courage to put themselves out there for all the world to see! Find out more about Karen at www.karenkohtz.com.